Worship and Order in the Church explains the biblical foundations of the Christian church: what it is, what God calls it to do, how it is to be structured, what its officers are, and how it is to guard its own purity through church discipline. 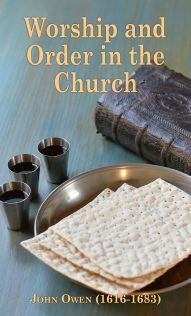 Owen’s carefulness and biblical perception will commend this lightly updated edition to church members and leaders alike as a very important resource for modeling our churches according to the Scriptures. The following catechism explains the constitution and ordinances of a Christian church, and the duties incumbent on its office-bearers and members. When it was published in 1667, the names of the author and of the printer were withheld, and no intimation even was given of the place where it was printed, lest danger should be incurred by the publication of a work advocating a form of polity at variance with the ecclesiastical system that the Court was at that time striving to render, as far as possible, universal in England. Dissenting congregations were, however, springing up in different parts of the country, and for the guidance of the Independents the catechism was particularly useful. It was so much appreciated that, in the same year in which it first appeared, a second edition with some slight differences and emendations was published; and hence certain discrepancies between the following version of it and the one that is given in Russell’s edition of our author’s works, printed from the first edition of the catechism. It came to be known as the “Independents’ Catechism”; and an angry attack was made upon it in 1669 by Benjamin Camfield, rector of Whitby, in Derbyshire, in an octavo volume of 347 pages entitled A Serious Examination of the Independents’ Catechism, and therein of the Chief Principles of Nonconformity to and Separation from the Church of England. The catechism, in the estimation of the rector, was “the sink8 of all nonconforming and separating principles”; and he takes Owen to task for inconsistency in holding the Scriptures to be a sufficient rule of faith and duty. An attack conducted in this spirit only bespeaks the influence that this catechism was beginning to exert in diffusing the principles and consolidating the interests of the denomination to which its author belonged. It was the occasion of another attack upon Owen, in the shape of a frivolous and bitter pamphlet with the title, “A Letter to a Friend concerning Some of Dr. Owen’s Principles and Practices,” etc. [from] 1670. A copy of the catechism had been sent by the “friend” to the anonymous author of the pamphlet, who forthwith assailed Owen in a strain of pointless invective. The first charge against him is that, when vice-chancellor at Oxford, he had discountenanced some invidious distinctions in the dress of the members of the university: “those habits and formalities by which persons of distinct qualities and degrees were distinguished in that school of learning.” It was an offense, too, that “when he was brought into Westminster Hall for his witness against Mr. Dutton, he refused to kiss the book, and professed it to be against his conscience to swear with any other ceremony than with eyes and hands lifted up to heaven.” The pamphlet closes with “An Independent Catechism,” where the views of our author are caricatured in a style that is intended to be witty. There might be ground for supposing that, on terms suggested by the catechism, a coalition might be effected between the two denominations; and Owen himself, in a subsequent work,15 indicated circumstances in which they could not have been in separation from each other without blame. Superior, however, in practical sagacity16 to his correspondent, he might see difficulties where Baxter saw none, or might feel that a formula of abstract theses was a waste of ingenuity so long as the mutual confidence was lacking, which alone could affix upon the union the seal of permanence. Too often the victim of his own ardor and acumen, Baxter was prone to believe that the difficulty of adjusting the wayward eddies of human feeling and opinion into one smooth and onward current, should yield at once to the same treatment as would suffice to work a problem or frame a syllogism.17 The consummation for which he sincerely panted—the outward unity of the church under one polity—seems as yet reserved in providence to grace distant and happier times.